It has taken me more than 20 years to research the compelling material that follows. I refer also to my own life experience of ‘a near death experience’ where my consciousness is experienced outside of the body. Although the soul is most likely multilayered, it has two prime parts to it. The ancient Egyptians knew it well. They referred to it as the ‘Ka’ and the ‘Ba’. The inner soul seems to exist within a ‘body veil’ or ‘soul shell’ in much the same way as a nut is encased in a shell. From all my research, I believe that the soul enters the body at the moment of birth, both the inner soul and its ‘body veil’. The astral body making up the inner soul appears as a golden light, while the shell visibly seems to be of a soft blue glow. No facial features are visible at all. Perhaps for two reasons: Because the detail is all of the same golden coloured light and secondly because the conscious self does not see its face 90% of the time. In effect this suggests that the soul consciousness as a being of light is merely a shape ‘of habit’. If the astral body wanted to, it could most likely take on any shape. 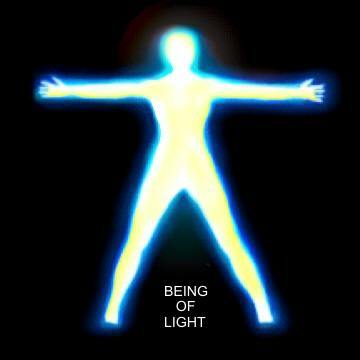 These two parts of the soul, merging as one, will be referred to here as a being of light. This being of light is naturally like this at death when the soul leaves with its ‘soul shell’. The process of the body decaying physically appears to release the ‘soul shell’. The ancient Egyptians resorted to mummification in an effort to keep the astral body connected to the person longer (see ‘silver cord’ in image below). They believed this process would provide the person with a chance to delay judgement and hence overcome some of his/her destructive habits. The Cherubim seem to have the technology to remove a soul from the body in its entirety as a being of light without death! The reconstructed image of The Tree of Life shows human souls as beings of light as explained here interacting with The Cosmic Tree. The soul appears also with an ability to exist outside of the body as an ‘astral body’. The astral body seems to be able to be induced out of its ‘soul shell’ yet stays connected. This seems to be the case in near death scenarios where the body is revived. More often than not the person will recall having been conscious outside of its body. When the body is in the form of an astral body state, the body veil remains as a protective shell for the body purely to maintain its bodily functions. 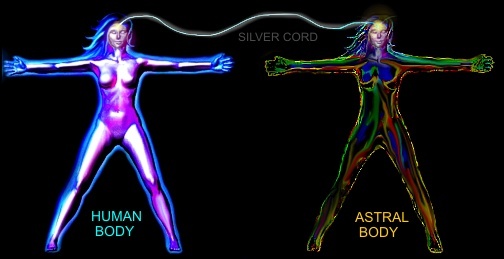 A micro thin silver cord connects the body veil to the soul - the mind - the astral body. 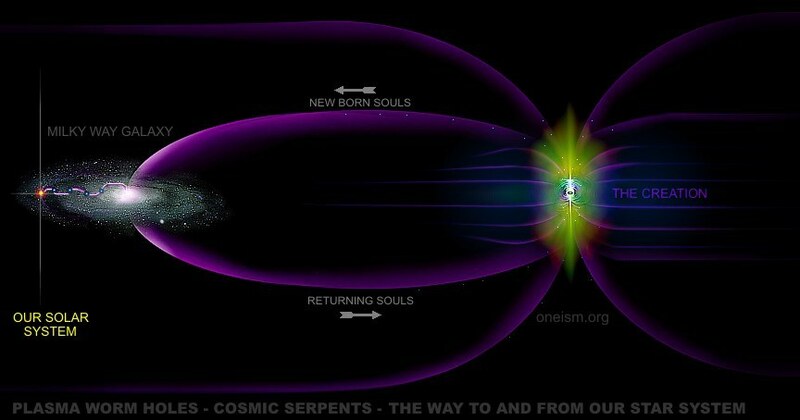 The cord is a mini plasma ribbon that can stretch infinitely within the universe. This link is how the soul finds its way back to return to its body. If you find yourself astral travelling, think of your body and you shall return. The gift of astral travel is a gift of life that we have completely forgotten. Even the ancient Egyptians knew about it and spoke of it passionately. The soul is designed to be a star traveller… during a person’s life here on Earth. But it is a gift only for those who seek it. 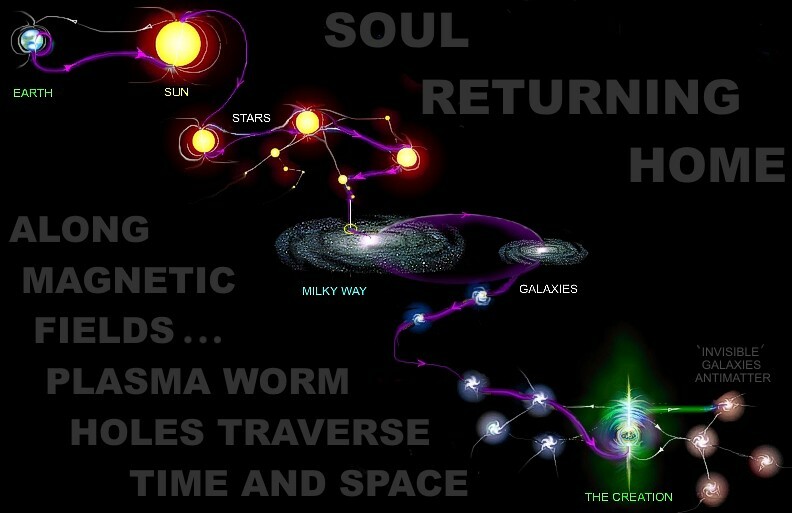 The soul seems to have been designed to visit other star systems and the Creation to learn great knowledge. There are two key reasons why we may have lost this crucial knowledge. Either the hierarchies of ages gone by have held onto it keeping it for themselves, or we have inadvertently lost this secret thanks to an existence of hardship over the millennia. In essence all the ancient dolmen, mounds, pyramids and temples were designed to facilitate a connection with The Creation. Perhaps people in the past have devoted a lifetime to developing their spiritual strength in these places, probably would be able to induce their soul out of their physical body as an astral body at will. A year of near seclusion spending vast tracts of time at my home alongside a river and below a rocky hillside, allowed me to revive my passion for exploring this possibility, an experience I had previously in a motor cycle accident. But astral travel was something he could not achieve. Instead It was during this time that he believes he was able to experience that which comes before the ability to astral travel. It is a scenario with mind awake body asleep and like peering through a lifting mist and seeing 'video clips' with no sound of the lost mysteries of humanity’s history. It was in this time that I compiled the bulk of what was to become the subject of my book and websites, always a work in progress. There are ways for the soul to be induced out of the body. Sacred places near what appear to be natural earth energy fields found in mountains and running rivers are ideal, alternatively artificial manmade renditions thereof. Perhaps the perfect place is inside the ultimate manmade geometrically sound mountains… the pyramids: An enclosed room of granite, an open granite sarcophagus to lie in… and a ‘star gate’ star aligned shaft to guide the human soul heavenwards. The Great Pyramid is probably the ultimate sacred place to induce the soul out of the body. It is the largest and no doubt strongest ‘energy’ for a geometrically sound mountain of stone, built alongside the River Nile and along Africa’s Great Rift Valley fault line, and last but not least, built with granite chambers inside it. The ancient Egyptians called granite ‘spirit stone’… probably not just by coincidence. Granite is probably a stone that acts like a capacitor in electrical circuits and allows the earth energy to build up and resonate. Consider the design of the ‘Kings’ chamber roof in the Great Pyramid below. It seems intentionally designed to increase its ‘energy’ tenfold, having many air gaps between many layers of granite. The sarcophagus was no doubt designed for the living and not for the dead! It is understandable that the occasional tyrannical leader would have wanted to be buried in a pyramid within a sarcophagus, believing that only he was worthy of its ‘magic’. This has been the case in the pyramids of the Maya. If one studies the great pyramid ‘of initiation’ - the Great Pyramid of Egypt’s Giza plateau - the obvious becomes apparent. It has four very narrow ‘shafts’ to the exterior all positioned in alignment with the stars in what I believe can only be ‘star gates’ for the soul. These are most likely used to target pre-calculated star addresses to be visited! Every day and every night different star systems align with the star shafts. The stars that align with the shafts most frequently are the stars near the Pleiades. 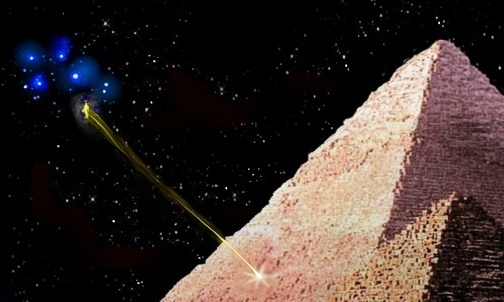 Once the initiate’s soul becomes ‘loose’, and the constellations patterns and Sun-like stars are learnt, the soul will be able to astral travel using much smaller pyramids, and without having to rely on the guidance of star shafts. Over time, a pyramid will not even be needed. The initiate will be able to achieve the same with only a small granite enclosure. The initiate at this point in time is no longer an initiate, but a fully illuminated and enlightened ‘star walker’. See below: A soul induced out of the living initiates body once the engineered door system with counter weights in the ante-chamber closes. The pyramids also appear to allow the plasma energy of The Creation to interact with an Earth energy bathed in exotic elementary atomic particles. I believe these vibrate at around 10 cycles per second. They literally resonate the soul out of the body. 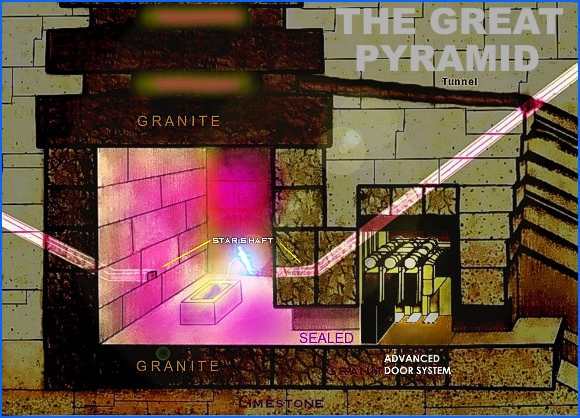 The main chamber in the Great Pyramid, the so-called ‘Kings’ Chamber is the perfect chamber for the initiate to learn to astral travel. The second chamber, the Queen’s Chamber seems to have a dual function. First of all it appears to be the chamber used to verify ones ability of travelling outside their body, by being required to identify and prove what is hidden behind the blocked ends of the shafts (these are the shafts that archaeologists have been trying to examine more recently with remote controlled cameras). Secondly, this chamber is used as an alignment target to other stars for the more advanced initiate. The third subterranean chamber was once used for the storage of ‘holy’ water. This chamber has no star shafts. Because it is completely sealed it is highly effective in saturating water with the exotic elementary atomic particle-based plasma energy of The Creation (see ‘God particle theory’) . It is this energy that is probably used to help induce the soul out of the body. With extensive preparation and years of practice the initiate will no doubt have very little trouble leaving the body. All the initiate needs to focus on is entering the star gate, the appropriate pre-planned star shaft, and like a bullet his astral body shoots towards the star system it has targeted. Whilst in the form of an astral body the initiate has only to think, to be able to propel and navigate. To return one has only to think of one’s body. Three people, among them one very famous person, are known to have spent a night alone in The Great Pyramid on separate occasions. It is worth mentioning that they are all documented as having experienced some highly strange phenomena during this time. I believe these experiences can only be explained plausibly as each person having been outside their physical bodies. One of these three people was Napoleon. What I would like to draw attention to is the destructive ‘phantoms’ aggressively tormenting and ‘challenging’ them that all three apparently experienced. I am of the opinion that these could have been ‘lost’ souls, trying to avoid judgement, attempting to enter another’s body, to seek refuge there in their state of vulnerability. It is quite possible for a destructive spirit to succeed in entering the body if one loses faith that you are safe in the hands of The Creation while travelling as an astral body. A strong faith creates a strong body veil. Lose confidence and panic and your body veil probably loses its protective strength. Schizophrenia is most likely a disorder resulting from another soul gaining entry into the body. As a free being of light, one will be perceptive to a magnetic flow. This magnetic flow can be compared to the movement of wind. The Creation will attract the freed soul into its field of flow, a spiritual field within a magnetic field of the cosmos. The soul will begin its journey home to the Tree of Life. The first sensation will be of travelling down a tunnel - a plasma worm hole - and then the appearance of a bright light, perhaps the first encounter of passing right through a star. The being of light passes through the first gate on the way to The Creation… our Sun. The soul is indestructible. In reality all matter is hollow. Even the centre of the Sun is mostly a vacuum of space. In the images here, the Sun in our star system - is the place of departure and the soul journeys from star to star along magnetic fields where wormholes seem to flow. Wormholes are not only for souls. It is highly likely that these paths are also the paths for celestial ships of the angels of our holy books to traverse space and time. Click here for video footage of a wormhole as seen above. The footage shows various video clips by witnesses of what appear to be unidentified flying objects exiting various plasma wormholes. In all the examples, the trail glowed afterwards like typical plasma. It may simply be space debris re-entering the atmosphere as scientists suggest, but if wormholes do exist as scientists say, then this is exactly what they would look like. Observers in the video clips believe the objects reduce speed as they exit the plasma trail. In one video example a second vapour trail more like that of an aircraft begins as the object sets off again. Another object exits the plasma trail creating no trail at all and a third goes into a spin. Before birth the foetus carries a small part of its new life force makeup, like a layer so to speak carrying a little of both parents’ traits. In its beginning phases the foetus most likely has some residual memory of its parents’ voices, life habits and personalities. Once The Creation ‘delivers’ the soul with its ‘soul shell’ to its place of birth, the soul with its individual consciousness probably enters the babies body once it is outside the mother’s protective shell, the body veil and most likely on the infant’s first breath. From here forward the soul and body shell remain together in the physical body until death. More on this valuable study will become available in time, as more and more statistics are compiled from the testimonies of people whose residual memories surface in regression hypnosis. Our ancestors made their pyramids and stone temple sanctuaries available only to the elite. 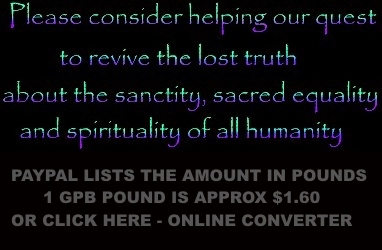 Their sacred teachings became hidden and the audacity of their greed has left a huge gap, with humankind having been deprived of illumination. Early civilisation across the globe was completely on track guided by the visitors who came from the skies, showing people the value of developing the secrets of the soul in caves in mountains in seclusion. Think of ‘Dream Time’ at Uluru in Australia, think of the Eastern empires of Angkor, think of virtually all temples ever built and the earliest churches with their imposing steeples entirely of stone. None of this is purely coincidence. It is time to revive the hidden records.